City Bingo Review | Claim 120 FREE Tickets On Deposit! Fancy taking in the bright lights of the big city? Well now could be the perfect time to take the plunge and make the move to City Bingo! You will find some awesome promotions, games and jackpots here at City Bingo. This site is powered by Dragonfish so if some of the offers on this site look familiar, that will be the reason why! New players are spoilt on this buzzing bingo site with a fantastic welcome offer to get them started. First up, new players will receive 120 FREE Bingo tickets when you add just £10. The best part about this offer is that there are no wagering requirements, so you get to keep what you win! Alongside your welcome bonus, you will also be eligible for 24 hours of free bingo games access with no deposit required, so you can sample the site before whipping out your credit/debit card. 120 free bingo tickets on your first deposit of £10. Free tickets on your second and third deposits. Guaranteed jackpot games of up to £3000. Play Break The Bank for guaranteed freebies every day. You won’t find any promo codes at City Bingo but who needs a promo code anyway when you have a wide range of jackpots and promotions at your fingertips? This is a mobile-friendly site and if you want to play on the go all you need to do is simply enter www.citybingo.com into your mobile browser, enter your login details which will be the same ones you always sign in with and then start playing! Players can enjoy a range of 90 ball bingo games and top slots on their iPhones, iPads and Android devices. The City Bingo icon can also be added to your home screen, making it even quicker to access all of your favourite games. Unfortunately, there isn’t a mobile app available for City Bingo, but it is easy enough for players to access the site on their mobile devices so you don’t really need one. Another thing we need to mention in our Citybingo.com review is the games. This top bingo site offers a wide range of games including bingo, slots, table games and scratchcards that will suit a variety of players. Bingo fans can enjoy a mixture of 90 ball, 75 ball and 5 line bingo games, plus on top of the regular games there are progressive jackpots and guaranteed jackpots for you to try your luck at. Slots fans are also catered for with popular games such as Fluffy Favourites, Shaman’s Dream, Temple of Isis, Supernova, Shopping Spree, and White Wizard to choose from. Among their selection of slot games, you’ll find some progressive jackpot ones such as Millionaire Genie, Wonder Woman, Piggy Payout and Irish Luck which gives you the chance to hit the big time and win lots of cash! As well as that you’ll find casino games and scratchcards so there really is something here for everyone no matter what tickles your fancy. Welcome offer gives you 120 free tickets. Big jackpots to be won. Payment options available on this site include Visa, Mastercard, Maestro, Paysafecard and Neteller. It can take up to 48 hours to process your withdrawal. Phone number: 0808 2387 546. 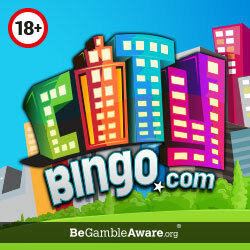 Overall, City Bingo is an enjoyable site to use and offers everything that new players could want. Yes, it’s powered by Dragonfish but it does have some exclusive promotions that stick with the theme which sets the site apart from the rest. We’ve given you an idea of some of the regular promotions you can expect to find at the site but one-off specials often pop up which give you the chance to win a city break so don’t miss out on that!